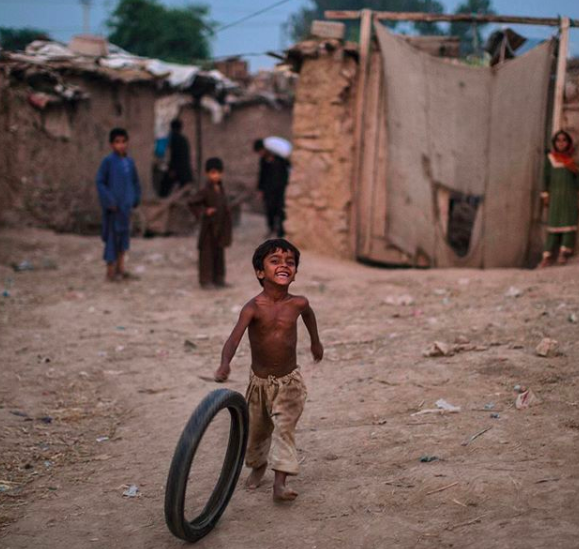 Photo by Muhammed Muheisen, captioned in his instagram account (@mmuheisen): "Playing with a tyre near his family’s mud home, 6-year-old Mohammed Farhan, an Afghan refugee in Pakistan. #muhammedmuheisen #everydayrefugees"
I remember sitting in class a few months ago and witnessing the unfolding of the testimony of a woman who was suffering from Post Traumatic Stress Disorder after the war. It doesn’t matter which war because we are taught as mental health professionals to handle most initial meetings with clients in a semi- uniform way. And so the therapist asked and asked again about who the woman was, where she came from, what she was experiencing and which her expectations were. In following the intake interview, I felt as if the therapist was either insensitive or audacious. He was either not appreciating the uniqueness of her experiences or he was bald enough to believe that his western, sheltered education could provide her with relief. And then I started working on a research on Human Trafficking survivors who are enslaved in Nigeria through a means of spiritual blackmailing, traded through Europe and the United States and emancipated in the West. My instinct was that with these women, privileged, western education that unties some spiritual handcuffs can be valuable. More specifically, Nigerian women who believe in juju, voodoo and spirits are many times held captive through the fictitious threat created by traffickers, that if they try to escape, they and their families will grow gravely ill and die. While negotiating cultural values in therapy is a hotly debatable issue, I suggested that westerns’ beliefs can, in this case, be enlightening. But experience is proving to me that we do not have all the answers, especially in matters of mental health. With depression and anxiety disorders proliferating in an infection’s rate across the Developed world while being scarce in underprivileged geographies and with refugees being our next-door-neighbour reminder of the human potential for resilience, I have built the idea of a mental health mentorship. If we are all humans of similar biology, thrown into discrete circumstances and if our tool box consists of five basic emotions, what can we learn from how refugees use the same tool box as our own to overcome tremendous, incessant trying conditions? In researching how we think versus how they think, I came across two nuclear pools: entitlement in the west and resilience in the developing world. Entitlement is the sense that privileges are givens, that good fortune is owed to us by the universe, that we not only deserve but we absolutely have to be happy most of the time and that what is unfair should not be happening to us. While noble causes when pursued through human rights crusades, I have discovered that this feeling of holding expectations from life has not only bubble-wrapped the western world from adversity but has also made us intolerant to feelings of sadness, boredom or of being overlooked. Resilience on the other hand, is either a feature or a structure created by challenged humans, such as refugees, who have not only suffered the desiccation of their families, their homes and their entire communities but who are doomed to a life of restlessness, where relaxation equates surrender or, simply, a fallacy dismayed by the first request of relocation to another environment. So how do they make it? In my most recent project that I will be presenting at an International Psychology Convention in Lisbon at the end of this month, I put together refugees’ most adaptive, most resilient- inspiring cognitions that can inspire westerns to grow stronger, through a reminder of what all people are capable of. Most enlightening to me was the idea of a collusion, instead of a collision of the good and the bad in the world. While in the west we tend to commit to black-or-white patterns of thinking, refugees have been able to not only recognise the coexistence of serendipity and misfortune but also anticipate it. This means that they expect conflict, fear and sadness in their lives. They are not caught off guard when a challenge occurs because they know that this is how life is. It is unfair but there is no reason why we can’t survive and thrive in it. So when westerns are discouraged from finding a job that is an ill-fit to their aspirations, refugees have a work ethic that is second to none no matter how many times they must deviate from their dreams. In terms of parenting, refugees have also provided the west with invaluable tools to guide the youth to a resilient and persevering path. That is, they teach their children to expect judgement, controversy or even offence within their host societies. Through a stoic spectrum, they train their children not to be disorganised in every personal attack they receive. They remind them of their personal, family and cultural values and they are also open to negotiating them with the host societies’ stances. The most adaptive of refugees are overthinking- averse. They create one, single narration of what and why it happened to them and they settle to it. We, in the west however, have an incessant need for “cognitive closure”, to know exactly what happened, when it happened and why it happened. This tendency to clarify leads to rumination that is inextricably bound to psychological distress. Having the fortune of living in societies that welcome instead of ostracize refugees, we now have a unique opportunity of a win- win integration approach. We can ask of refugees to lead mentorship programs addressed to vulnerable populations born and raised in the west. Imagine being raised in- between foster homes and then finding a mentor who may be close to your own age and who has actually survived and escaped war. Imagine having him or her talk to you about resilience, about effort, about having the world against you but still moving forward. Refugees are the breathing proof of the human capacity to adaptation. As host societies, we should offer them the chance to share their wisdom, to inspire and to create their own force of humanitarian work in leading the west to a more adjustable and resilient way of thinking. There is great knowledge, clear instinct and sangfroid prioritising in refugees and these skills are craved for in peaceful environments. So let’s urge them to take the lead and to help us grow resilient to mental health challenges.